From Meredith to Mommy: Amazon and Wishenpoof - Another Big Hit Here! Amazon and Wishenpoof - Another Big Hit Here! Thanks to KidzVuz for sponsoring this post! Finding good kids shows can be tough. Really tough. I want the girls to grow up to be nice, to be good friends, and to have compassion, and I love when we find someone like that in a show that's fun. Sometimes it seems like the kids have found a great one...until you hear an attitude creeping into conversation that sounds a lot like one of their beloved characters. Or it seems like it has a good message, but after a few episodes the kids lose interest because it isn't engaging. Or it's basically the same old show. Having a talent...learning to use it...making good choices...believing in yourself. Sounds like a great message for any kids show to have. Add in some fairy wings, some sparkles and a little girl with some wish magic, and you have my girls hooked. Hands down. Even though the girls have tablets to use, one of their favorite things to do is steal my Kindle. In the past year, we've found some great original shows. Madison loved Annedroids and all the opportunity Anne had when she put her robotics skills to work. Both girls LOVE Creative Galaxy and the projects that Arty inspires them to try. With Amazon Video, they can watch them anywhere, and that's a huge hit. But on my Kindle, the shows appear directly in the carousel, and something about that appeals to them in a big way. And in addition to those shows, they get to see the suggested shows underneath. One of the suggestions they've had is Wishenpoof. They watched the pilot episode and loved it...but that was it. 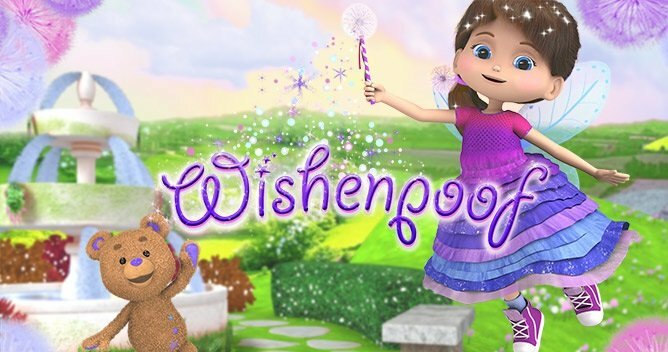 Now, Wishenpoof has been picked up, and we got the chance to review the first season. I'm always interested to see if some of these kids shows can carry on after a successful first episode. Sure, the girls loved the one. But would they keep watching? Well, in just a few days Madison has managed to watch the entire series. Twice. So, yeah, I think she'll keep watching. I posted a picture of her on Instagram. She's starting to get familiar with Instagram, so she clicked the tag in my caption and was blown away by seeing other kids watching with Fire Kids and fairy wing. And she even was able to see the girl who plays Bianca, the main character with wish magic. After grabbing some wings of her own and stealing my Kindle to get that experience, she started again. Bianca's mom is always there to help her realize her potential. Bianca is the main character in this series. One birthday, she makes a wish and gets the same wish magic her mom has. However, now that she has it, she needs to learn how to use it, and more importantly, how to use it well. She uses her wish magic to make things she imagines come to life, and to solve common pre-school and kindergarten problems in creative ways. The first episode is all about learning to grow your talent and believe in yourself. Sure, sometimes it seems like the talent (or magic) is just there, but having talent doesn't guarantee success. You have to practice. You have to keep trying. And above all, talent (or magic) doesn't make everything easy. You still have to believe in yourself. The second episode felt so true to our experiences recently with "real" and "imaginary". Bianca uses her wish magic and imagines a unicorn. She helps the unicorn solve some problems by speaking up. In Bianca's school life, two of her friends aren't getting along. One of them has imagined a pink and purple horse, but the other, feeling very knowledgeable and mature, informs the first that pink horses aren't real. Horses are brown, or white or black. 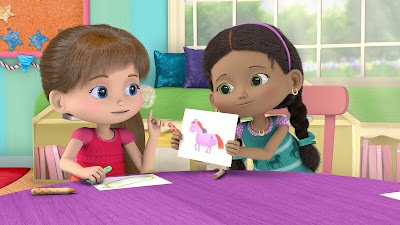 The picture of the purple horse is wrong, and the two girls struggle to get along. Bianca helps out, both with her belief in imagination, and her ability to speak up when she feels people aren't being kind. Such a common preschool issue, and I love how it was dealt with. There are episodes that deal with listening to what your little brother (or, in our case, sister) wants to do, and not insisting they are the same as you. There are episodes that deal with taking a big job and breaking it down. And most of all, every episode covers the concepts of trying again, believing in yourself, exploring your imagination, and making good choices, with magic or without. The only drawback to me was the voice of Bianca...but not in the way you think. Bianca (played by Addison Holley, who is also the voice of Miss Elaina in Daniel Tiger) sings many inspirational songs, and she sings in a clear, clean voice that the music teacher in me loves. The issue I have is that Bianca's mature, trained singing voice sounds markedly different than her young girl speaking voice. To me, I hear Bianca age from five to seventeen when I hear her sing. As an adult, that kind of bothers me. I asked Madison about it, and she didn't care one bit. Mom, that's just how people sing. So there you go. Mom voted down. The series will launch tomorrow, Friday, August 14 on Amazon Prime with 14 free episodes. Definitely worth checking out if you are looking for a show with a great message, a good dose of imagination, and just enough sparkles to inspire fairy wings and glitter. And it may even be worth the loss of my Kindle to my very addicted daughter.